You know what I LOVE LOVE LOVE at any time of year? SOCKS! 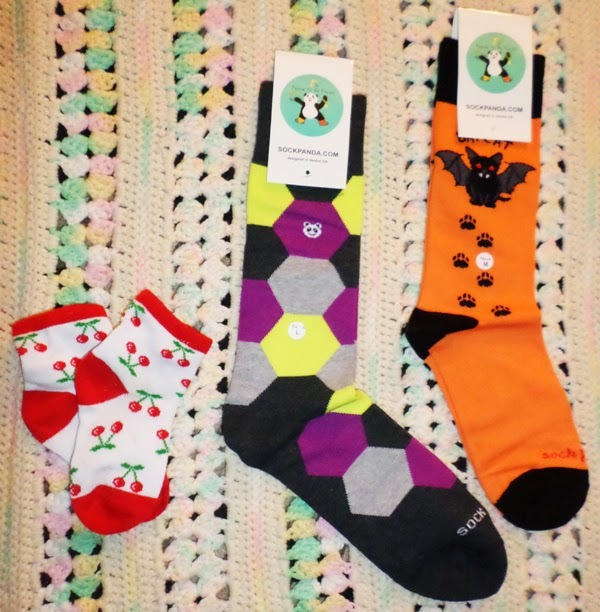 Lots and lots of fun-filled, socks with patterns for all occassions - and you are not going to find a better way to jazz up your sock collection this season than by subscribing to Sock Panda's monthly subscription service!! I can not rave about these guys enough as they have ALWAYS pulled the most fabulous socks out of their hats and this time around I have this cute pair if cherry kids socks to show you alongside a mens stunning, bright pair of fashionable socks and a womens pair of "BatCat" socks, which I wore over halloween and which I will wear all year around until they are worn into the ground because they are just so fabulous! Well! You go to the website, sign up to the subscription service, they send you fun socks and then BAM - satisfaction, smiles, happy dance and warm feet abound! This makes for a GREAT gift for absolutely anyone this holiday season and walks its way into our Holiday Gift Guide (#MGBHGG) with ease! Why not check out Sockpanda.com today and keep an eye on their Facebook and Twitter page (@TheSockPanda) for more! I love them, and I know you will, too!! Disclaimer: I was provided with product in return for this post but I absolutely adore this company and all opinions about them are my own. Your views and experiences may differ! Thank you! I love socks with graphics on them. There is something so much fun about wearing socks with designs on them under your clothes. I recently picked up some 'fun' socks at the store and got so many compliments on them. Will have to check this out, maybe it'll become my new source! I used to do a sock subscription. I love getting socks in the winter!